17 Feb 2015 – Five years ago I was invited to become the chief political commentator of the Telegraph. It was a job I was very proud to accept. The Telegraph has long been the most important conservative-leaning newspaper in Britain, admired as much for its integrity as for its superb news coverage. When I joined the Telegraph had just broken the MPs’ expenses scandal, the most important political scoop of the 21st century. I researched the newspaper’s coverage of HSBC. I learnt that Harry Wilson, the admirable banking correspondent of the Telegraph, had published an online story about HSBC based on a report from a Hong Kong analyst who had claimed there was a ‘black hole’ in the HSBC accounts. This story was swiftly removed from the Telegraph website, even though there were no legal problems. When I asked HSBC whether the bank had complained about Wilson’s article, or played any role in the decision to remove it, the bank declined to comment. Mr Wilson’s contemporaneous tweets referring to the story can be found here. The story itself, however, is no longer available on the website, as anybody trying to follow through the link can discover. Mr Wilson rather bravely raised this issue publicly at the ‘town hall meeting’ when Jason Seiken introduced himself to staff. He has since left the paper. After my meeting with Mr MacLennan I received a letter from the Telegraph saying that the paper had accepted my letter of resignation, but welcomed my offer to work out my six-month notice period. However in mid January I was asked to meet a Telegraph executive, this time over tea at the Goring Hotel. He told me that my weekly column would be discontinued and there had been a “parting of the ways”. That was how matters stood when, on Monday of last week, BBC Panorama ran its story about HSBC and its Swiss banking arm, alleging a wide-scale tax evasion scheme, while the Guardian and the International Consortium of Investigative Journalists published their ‘HSBC files’. All newspapers realised at once that this was a major event. The FT splashed on it for two days in a row, while the Times and the Mail gave it solid coverage spread over several pages. This was the pivotal moment. From the start of 2013 onwards stories critical of HSBC were discouraged. 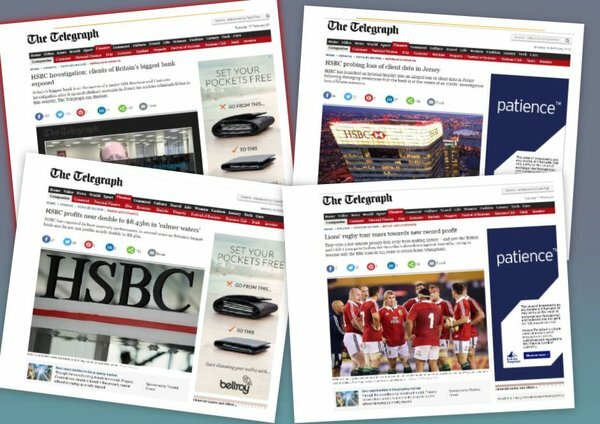 HSBC suspended its advertising with the Telegraph. Its account, I have been told by an extremely well informed insider, was extremely valuable. HSBC, as one former Telegraph executive told me, is “the advertiser you literally cannot afford to offend”. HSBC today refused to comment when I asked whether the bank’s decision to stop advertising with the Telegraph was connected in any way with the paper’s investigation into the Jersey accounts. When I sent detailed questions to the Telegraph this afternoon about its connections with advertisers, the paper gave the following response.